Get God’s Little Explorers (Complete Download and Bonuses) for $20! Wondering what the difference is between the free version and the complete download? Be sure to check out the top 10 differences here. Looking for the free curriculum? Scroll down to find the links for each week! I am so excited to finally be sharing our preschool curriculum with you! I knew this would be my last year with a preschooler in the house (unless the Lord blesses us with more), so I really wanted to make it fun and special for my youngest daughter. I brainstormed several names for Christian preschool curriculum, but I couldn’t quite figure out the right one. Then, early one morning, my daughter suggested the name “God’s Little Explorers” and it just seemed to fit. During the year we’ll be journeying through the Bible (exploring God’s Word) and we’ll also have a new letter and theme each week (exploring God’s world). I will be posting a new lesson plan each week on Thursday evening (to give you time to look it over and prep for the next week). I’ll also included a link to each lesson at the bottom of this post. The alphabet will not be presented in order. I will be focused on teaching lowercase letters first (see why on this post I wrote about teaching your child to read). If your child already knows lowercase letters, feel free to add capital letters, too! You can begin whenever you desire (although I set it up so J for Jesus would fall in December if you begin the program the first or second week of September). I’ve tried to make the lessons fairly simple and use items you can easily find around the house. There are some projects that require a little more preparation though. If you do everything in the plans, you will spend approximately 30-45 minutes per day on focused instruction. Please remember, this is still in-process! I am open to suggestions or modifications. I’m still pondering the best way to present the activities and make sure everyone understands the vision. 3) ABC & 123: This time will specifically introduce an alphabet letter. We’ll also be exploring colors, shapes, and numbers during the year. 4) Life Skills: Preparing a preschooler for life is much more than teaching them the ABCs! Each week, we’ll review various self-help skills, learn to complete chores correctly, practice manners, and do a service project. I’ll also list additional activities you can use to substitute for ones you might not like or have time to complete. Book Bag: I will list books to go along with the theme and suggest an activity to be completed around the book. Learning Bags: These are my version of busy bags. I use these when my little ones need an independent activity to work on while I work with my older daughter. I’ll be sharing links to some you can create to have on-hand and use when desired. The only things you will really need to participate in this program with us are basic school and craft supplies and a children’s Bible (we are using the Read And Learn Bible ). I do have a few other recommendations for some of my favorites that we will be using! You can find all of my recommendations for our home preschool curriculum here. I’m sure I’ll be adding and updating as we use more that I forgot about! Please feel free to contact me with any questions or concerns you may have! I would absolutely love your input and ideas to make this a fun and excellent experience! Week 28: Review Week & Party!! Thanks, Laura! 🙂 I’m excited that it all finally seems to be coming together! Thanks, Mackenzie! I have been working hard…and I think it’s going to take some more work, too! But it’s fun and I love doing it! I’m really excited about this! Our youngest is 3. He’s always asking to do school while his brothers are working on their schoolwork. I’m SO not good at planning/organizing so this is exactly what I need! I found your blog just a couple weeks ago, I think, and now I look at it daily! I have used several of your printables already. Thanks for being a blessing to me! However, My schoolroom is much more organized because of you! I’m doing better teaching my 6 year old to read because of you! And I’m still working on putting together reading and math boxes. Ha, ha! I was trying to think what printable that might be! Well, I hope this will be helpful for you and at the very least give you a few new ideas! This is fantastic and so exciting! Thank you for doing this! I have two 4yr olds at home with me this year and I am excited to try this out with them. Can you tell me where I go to download it? Forgive me if you haven’t yet posted and I am jumping the gun! Hi, Kayla! It will be a new blog post each week with the lesson plans. I just posted today’s, so you can find it at https://www.motherhoodonadime.com/kids/gods-little-explorers-week-1/. I’ll also be updating this post each week and adding the link to it. I’m excited to see your posts. I just started homeschooling my 5 year old two weeks ago. I also have a 3 year old (turning 4 in a few weeks), a 2 year old and 7 month old. My almost 4 year old has really wanted to do “school” like her big brother so I am excited that I will have something to do with her. Thanks for your time and talent! Thanks, Becky! I hope there are some fun ideas you can use! Just happened across this curriculum via Pinterest. A friend and I were talking about collaborating to teach our 2 year olds this year. Looking forward to using this (and making whatever modifications necessary)! Thanks for joining me, Ashley! Thank you so much for sharing this great curriculum!!! Thanks, Sam! Hope you have a great time with your daughter! My fourth child will be ready for preschool next year. I too designed my own curriculum for preschool so I have spent many hours searching online. This is by far the most unique I have found. I have new excitement for preschool next year! Thanks for sharing your ideas! They are great! Thanks, Jen! It’s a labor of love, but my littlest daughter has been having so much fun! It’s great memory-making time. Please feel free to share your ideas. I’m always updating and changing and looking for new ideas! I am so excited a friend recommended this to me! I have been doing basic curriculum with my 3 year old son for about 2 weeks now and wanted something a little bit more. This is perfect! I can not wait to teach my son more about the Bible and his basic everyday life skills. Thank you, thank you, thank you!!! I am starting this on Monday! Have a blessed day! Thanks, Bobbi! So glad to have you! Also, feel free to share any idea….it’s a work in progress! Hi Stacie! I’m excited to have found this curriculum! I can see that a lot of thought and planning has gone into it. I can’t believe it’s free! I really struggle with finding age-appropriate activities to do with my super-smart, super-busy 2.5-year old daughter. How old is your youngest daughter? Is 2.5 too young to start using this curriculum, do you think? I don’t want to rush her for sure, but I want to do more things with her that she might enjoy. Hi, Lori! My daughter is 4, but I think the lesson plans are easily adaptable. I designed it very hands-on, so you could pick and choose what would work best for you. I have no doubt some 2.5 year olds would be quite able to take part. Feel free to give it a try, change what doesn’t work for her, and use what does! Thank you so much for providing this Stacie! I’ve been looking for something new to do with my toddler/preschooler so I could incorporate them both into the learning and not feel like it’s a repeat of what we’ve done in the past. This is perfect! I love the way you’ve structured it and can’t wait to get started! Thanks so much, Cindy! Hope you have fun with it! LOVING this resource. THANK YOU!!! We’ve been working on cutting and tracing worksheets for my 2 year old but I am looking for ideas to incorporate Christ in our studies and this seems to fit the bill!!! p.s. I’ve added this to my pinterest board so that I can come back in the future when we’re in need of activity ideas (and so I actually remember where I found this great idea!). thx again. Thanks, Rachel! I really wanted to take my daughter on an exploration through the Bible. I’m trying to hit major stories…and have a lot of fun and memory-making along the way! Glad you’re joining us! thank you so much! I have been looking for more ideas to keep my 3 year old busy as he will not be attending a regular Pre-K program. What an awesome site you have here! Thanks so much, Patricia!! Hope it is helpful for you! I ran across this from freehomeschooldeals.com and am SO thankful! What we were doing wasn’t working for my almost 5 year old. I sat down at the PC and prayed about what we should do and God said “Character.” Though this isn’t specifically character it’s perfect as it takes us through the Bible where God’s character is revealed and we can talk about it, it isn’t too crafty for me, doesn’t require me cutting out tons of pieces and print tons of worksheets, my son LOVES it and so does my daughter (2.5yrs). We’re supplementing handwriting since my oldest is almost 5 and very ready to write and we’re doing Biblical Character specific devotion at night as a family. Thank you, thank you, thank you!!! Welcome, Kristin! That’s so awesome! I was hoping that everyone would just take from it whatever God leads them to use and supplement however necessary! God knows your child best and you know him second best, so I love when I hear that others can use what I’m sharing and make it fit for their child and family. Thank you! Thank you! Thank you! I have two daughters ages 6 and 3. I am teaching my 6 yr old who is in 1st grade but have been having trouble finding the right resources for my 3 yr old who wants to “do school” too. This sounds like something that is fun and at her level. Thanks for joining us, Paula! I hope it is helpful for you! Yay! It’s very flexible…and I hope you have a great time with it!! I would just like to thank you for your generosity in making this resource freely available. I plan to start using this in September for my children who will be 3 and 4. I’m sure my youngest children ages 2 and 1 will enjoy participating/observing as this seems to be highly adaptable for those ages as well. Thank you so much for letting others benefit from the time you spent putting this together!! Yay! I’m always sooooo excited to hear that my work will be helpful to others! It’s been a fun adventure, and I’m glad to share it! Thank you so much for this wonderful resource! I was wondering at what age you recommend starting this. My son will be 3 in the fall. Hi, Michaela! 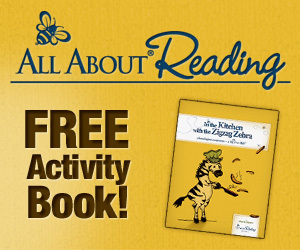 It is easily adaptable for 3-5 year olds…and maybe even some 2 year olds. Just take what works for your son and leave the rest! Is there a reason you don’t do the alphabet in order? Because I’m going through the Bible and by theme, I picked the letters based on that. I know some people are bothered by that, but it really makes no difference when you are teaching the letters. I focus on letter sounds and visual recognition and not the letter names. Is it okay if we use this with a small Mother’s Day Out program at my church? I have purchased it and the other teachers will as well, but I just wanted to check. Thanks! I would be fine with that as long as each teacher has their own download! Thanks so much for asking! Just curious if, in the new $14 download, the activities that you suggest in the lesson plans are typed out (rather than just a link back to the webpage where it’s explained with a photo). It’d just be easier to look at the directions rather than getting on the computer to check. Hope this makes sense. Thanks! No, it is the same lesson plans (mostly) which include the linkbacks. To write everything out and add the photos and step-by-step would take a huge amount of time. Eventually I hope to do that, but the price will have to be raised quite a bit (more in line with a typical home preschool curriculum) to justify the amount of time it would take to develop. I completely understand what you are saying, but with homeschooling, blogging, and everything else going on, I don’t have time this summer to do that! I’ve already poured at least three to four hours each week for twenty-eight weeks plus countless hours putting the complete download together, and, well, this mama needs a break!! Hi Stacie, I recently purchased your curriculum Gods little explorers. I received it my email but didn’t download it yet. My messages accidentally got deleted along with the curriculum, could you please resend it? So sorry for the inconvenience. 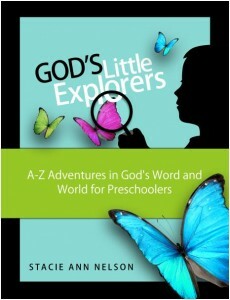 I have been researching and really like your curriculum “God’s little explorers.” This is what I have been looking for. I wanted something more that just learning “ABC’s” and with a biblical side to it. I was wondering if I could buy an actual book not just the downloaded version. Because some of the lessons link back to my site for directions for specific projects, there is no way to offer it as a book at this point. It would take lots and lots of hours to get that ready, and I just don’t have time to do that this summer! Eventually, I hope to offer that option, but it won’t be until next summer. Many people are still printing out the lesson plans and just using the digital links to refer back to the directions each week as needed! If the order went through, you should’ve received an email with the link to it. Also, you might check your Paypal account and see if it shows up there! I just checked and found your email showing your receipt from Paypal, so I will send you the link again! Just finished week 1 and my nearly 3 year old really enjoyed it! Was making some pretty decent x’s by day 4. I’m really looking forward to continuing to use your curriculum (with some adaptation as we live in Tanzania and well… :). Also looking forward to making up some of your busy bags with our 9-13 hour regular drives- fantastic ideas! Thanks so much for being a blessing to our family! Yay!! Of course–adapt away!! Wow. I’m just trying to imagine 9-13 hour *regular* drives. That would be challenging! Thanks for blessing me with your comment today! Hi, Toney! I would count back 14 weeks from Christmas (and I would actually go a few weeks before Christmas) to figure out when you want to begin. I will be sharing my recommended schedule in July for those people who want to go through it together! First let me just say how much I *love* this curriculum! Thank you so much for putting it together! I think it’ll be perfect for me (and my newly 3 yr old daughter!) to see if homeschooling is something we want to do long term. That being said, I’d love to blog about our homeschooling adventures using your curriculum when we start it this fall — if you don’t mind. I would, of course, always link back to your pages when applicable. I started your curriculum with my almost 3yr old last week and we are really enjoying it. Everytime we go back to talk about what we are learning he tells me “God’s word is a treasure” if this is all he gets out of it I’ll be happy and I’m sure he’ll learn much more. Thank you for making it so easy to access and use! Hi, Stacie! Just wanted you to know I posted a review of God’s Little Explorers on my blog. Thanks so much for making it available! Stacie, I love your website and love that you have shared it with us! Thank you! I am Mom to two boys (2 and 3 months) and am considering homeschooling, but haven’t made my mind up yet. I have a question regarding using your curriculum and ideas. Would you allow me to use your curriculum with my local MOPS (Mothers of Preschoolers) preschool classes? I am the coordinator for curriculum, and always have a tough time coming up with a simple, easy to use (and budget friendly) curriculum to implement. It would be for my local chapter only. We teach ages 1-5 while the children’s moms are taking part in a meeting/fellowship time. I am willing to purchase the curriculum book as well! Thank you so much for considering! God bless! I just sent you an email. Be sure to check your spam if you don’t see it! I’ve been looking for something like this for my daughter and this is PERFECT. It coincides right along with what I’m teaching her and will not only re-enforce her heart with Jesus, but also her letter recognition. Just brilliant!! I’ll be sharing some time management and scheduling in the upcoming weeks! I recommend glue sticks, scissors, pencils, colored pencils, crayons, markers, and an abundance of paper! Other craft supplies you can find at a Dollar Tree or discount place include craft sticks, pipe cleaners, pom poms, stickers, paper plates, etc. Eventually, I hope to add a complete supply list, but I just haven’t gotten to that yet! Wow, wow, wow! I am printing out the curriculum now. THANK YOU for your love for the Lord and sharing it with all of our children. I am pregnant with my third boy (maybe my 3 boys should meet your 3 girls one day…ha) and did not have the energy to write my own program, although I thought I might be resigned to because as a former elementary school teacher myself, I thought the few programs I came across just never seemed as rich as I imagined beginning education with my child could be. But you nailed it!! And to think the VERY paltry price you are asking for the download is itself going to a bigger purpose to help MORE children. I am inspired, amazed…and totally excited to begin making memories with my own sons. What a gift you have given us all! Thank you so much, Becca! I really appreciate your encouragement, and I’m so grateful it is helping others! I’ve been looking for something like this for over a year now!! I’ve tried a different preschool last year, and felt over overwhelmed!! I know this is from last year, but can we still use it?? My son starts school the 3rd, and that’s when I was planning on starting with my daughter!! Thank you so much for all your hard work!!! Of course! It should work whenever you want to do it! I will be reposting each week as we go. Awesome! That would help a lot. Do you know when you’re going to start posting them again each week? Maybe I’ll wait until you post them. I’m going to repost them starting Sept. 4th for a start date of Sept. 9th! I am so excited to start this in the next couple weeks!! I wanted to do it last year but my little guy was just to young. I am working on our schedule right now. Do you know when you will be starting weekly emails? I am going to try and follow the same schedule. I’ll be reposting the series starting next Wednesday! And, I’ll be posting a schedule, too. I’m planning the start date as Sept. 9! Let me start by saying that I LOVE this curriculum and am SO grateful for all your hard work creating it and then allowing others to use it!!!! I came across it a couple (ish) months ago on I Can Teach My Child and bought it from her link for $10. I just started it with my son this week so I was exploring your blog for tips and ideas and saw that it’s free now? Or was there something extra I got for paying for it? I hope I don’t come across the wrong way here. I really am just curious. We are really having fun and already learning new things with this great curriculum! When I started sharing the curriculum last year, I posted each new lesson plan weekly. Those are free for people to download week by week, however I consider the bundle far superior since it includes some extras, the worksheets are professionally done (compared to my lame attempts at creating them in the weekly downloads! ), you get access to a Facebook group, you have the convenience of just one download (instead of 28 separate ones), and the funds are supporting a great cause! Of course, that is just my opinion!! I haven’t searched through all the comments to see if anybody has already alerted you to this, but Week 23 is mislabeled as a duplicate of Week 22 (I think?) and there are no days 3&4 for Week 28…or they do not exactly follow Days 1&2 on the download. Yes, I’m that dorky mom that printed out EVERYTHING and has them lined up in sheet protectors in a binder…pencils all sharpened, ready to begin tomorrow 🙂 Or maybe I missed something?? Thank you for letting me know! Week 28 is a review week, so it is just 2 days! I am trying to print out a few weeks of God’s little explorers… Every time I try to click on week 1, I get the files and blog post from week !0 “k is for Kingdom”. am I doning something wrong? btw…I am in midst of printing and collating files from several sites blogs to make a calandar notebook.. we need this and I Love your notebook in landscape form… I only have a black and white printer, so im using markers to spruce it up a bit and make it look cheery like your files. We have been using your curriculum for a few weeks now at my daycare for our preschool time and love love love it. I have made the purchases and tried to sign up for the private FB page. Is this something I wait for you to ok and then I will see it? Thanks for doing the great work and making it affordable. Blessings to you! I have approved everyone who has asked to join, so you might make sure you requested approval to join! Our family lives in Indonesia and we have two kids, ages 2 1/2 and 3 1/2. We started using the God’s Little Explorers Curriculum six weeks ago and have been having so much fun! My son was begging me to do school this morning (Saturday)! Thanks for so many creative ideas that are easy to use right away. Your curriculum has helped make my job as a mom a lot more fun!! I am so thankful! I have a 10 year preschool teaching background, but when I became a stay at home mother, I wanted to do something different. I have been searching for months for something exactly like what you are doing! I am in tears just writing this comment because God is SO faithful and has used you to bring me the desires of my heart! So, thank you! God’s richest blessings on you and your family always! I purchased God’s Little Explorers yesterday and something happened with paypal and they needed to reset my information. So I purchased the curriculum again but this time did not go through paypal. Is there a way for me to get the money back from the first purchase? It’s still showing up on my bank statement as pending. You will need to email me at motherhoodonadime at gmail dot com. I will try to help! I saw two purchases from you. I issued a refund for the one sent today. Let me know if you have any questions. Hello, Thank you so much for all of the hard work you put into this curriculum and for offering it to us!! My daughters are 4 1/2 and 3 and we are starting this on Monday. I am so excited to get started! I do have a question though. I noticed there is not a math section (at least in the first few lessons that I read through. Please correct me if there is further down) I am just curious if this is something that is needed in Preschool and just starts in Kindergarten or if I should look into another resource to teach Math skills. I was Home schooled from 1st grade through 12th so I should know this stuff but it is a whole new ballgame teaching your own children! Hi, Cassandra! Most of the math skills are included in the ABC & 123 section! It’s just very basic counting, number recognition, one-to-one correspondence, shapes, colors, etc. You should be able to adjust the activities up or down depending on your child’s skill level! I feel as if I have been in the mines for ages and just came across the most beautiful gem custom tailored to our needs, beliefs, passions, and schedule! Thank you so much for all of your hard work! I have served for 10+ years in children’s ministry and now have the blessing of staying home with my children! I’ve been searching for something inexpensive, clear-cut, versatile and rich! Your curriculum is basically a dream I have been working on in my free moments, but you’ve already done all the hard work and I CAN’T WAIT to start using it w/ my lil guy! Thank you so much! How do you recommend scheduling? Just generally, about how much time do yo spend/day on this with you kiddos? Do you split it up? Would love to hear how you and others did it! My name is Liz I’m commenting in regards to wanted to order the complete God’s Little Helper for $14 I’m having a problem figuring out where I do this at and was wondering if you could direct me? What version of the Bible is used in the paid version? Thanks! The verses are in various versions–they are the same as is in the free lessons! I didn’t use one specific translation. God has laid a vision on me….I am a in-home daycare provider and have been for 21 years; however, God is wanting me to open a daycare center. I am searching for a Christian/Bible-based curriculum. I have come across your website while using Google and find it interesting. I am concerned though because it is based on 28 weeks of lesson planning. The vision that God has given me pertains to running the center as if we are in Vacation Bible School every day – moving from area to area – crafts, music, lesson, recreation, lunch/snack time, etc. The center is to have areas designated for science, math, reading, history, and so forth. So many ideas are going through my mind; however, I do believe it is important to have a Bible-based curriculum. Something that can be used for each area, and this curriculum sounds as if it fits right into what God wants. I’m curious, do you think age 2 is appropriate to start this program or would you suggest waiting another year? If you think it’s too early what do you suggest I do with my son for the next year? I’m just so excited to get started already! You could definitely start and just adapt things for your child! You could also slow it down if it seemed not to fit. I tried to make it pretty easy to adapt–especially if you just use the letters and Bible stories as your guide. You can add or subtract whatever you need to do! PLEASE HELP! I purchased this curriculum like a year ago when you had it on sale for $10. I received an email with the link to download it but haven’t printed it off yet. I am just now getting prepared to start it with my first child in August (he is turning 4). BUT I had problems with my email account this spring and lost all my old messages. Is there anyway that I could have the link emailed to me again so I don’t have to purchase the curriculum again! Thank you! Sure! Just email me at [email protected] and send the email address that you used for Paypal. I can look it up and resend it! This curriculum is amazing. I have a 1-year-old granddaughter so I have also signed up my daughter to receive your postings. It’s never too early to start! I am also the curriculum director of “Randy’sClass” homeschool. The boys are in the 5th grade, but some of this is going to be usable by them. The preschool Sunday school teacher will also have access to the material. Ours just came from a garage sale, so I don’t really have any knowledge of what’s out there. Sorry I can’t be more help! does the curriculum come in hard copy, where its in binder form already? It is currently only available as a download! I love this all! Thank you for your time! Hi I just found this and I love it!! it is so awesome and exactly what I was looking for for my son! Thank you so much for putting this together. I plan on buying the upgraded version but I was wondering if you had a supply list for each week that basically listed what you would need for all the crafts each week? Because I want the curriculum to feel very flexible, I didn’t include a supply list. I want moms to feel like they can easily switch activities in and out and not feel tied into getting certain supplies. My hope was for it to be easily adapted to whatever you had on hand or whatever you wanted to do! Thanks so much for posting this curriculum. I’m excited to work through it with my four year old. I am having trouble downloading week 17 – letter B. Could you check your link for that file, please? Thanks. The link is working, thanks! This is great for us because my son is in daycare full time but learns much better one on one. So we are using this as a supplement to what he is learning in daycare and adding the bible aspect. We started our creation book last night. We even skipped a week due to illness and busy schedules, but I don’t feel rushed about it since it’s not a 52 week curriculum. I love being able to pick and choose the activities I want to do, especially since our time together is limited. I love everything about this idea and would love to get started with it just wondering the links aren’t working for me is there something I need to do first to get them to work. Hmm…I haven’t had that comment before. Maybe try a different browser? I know that you say we can start at any time, but with it starting to be January lol, I was wondering if it’s really better to start at week 15? My son is only 3.5 but VERY bright (already reads basic books, and is EAGER to learn, bores easily, and we NEED THIS!). So I was curious if YOU personally would start at week 1 or week 15? Either way, we will be going through the entire curriculum, it is just a matter of where we are starting 🙂 TIA! I started this curriculum with my 3 year old the first week of Jan. as a trial run to see if he was ready and how I would do at teaching. I have to say that we both love the curriculum and look forward to our school days each week. We are now going into week 4, I add some extra activities along with the curriculum for use to do each day. Instead of making our explorers map out of paper, I purchased a tri-fold project board and we drawled our map on the bottom of it. I also added the days of the week and month to one side and Velcro stickers to the other with interchangeable weather items so that we can check the weather each day and change out the day of the week. There is also a place to add our weekly bible verse with Velcro. Thank you for putting together this awesome curriculum. Today is day 2 for us and we are loving it! My 2 yrs old likes it too!, he gets to do the fun stuff while my 4 yrs old does the “work” part. Hi. I have the big pack for homeschool, but I don’t see the rest of the creation book in the download. Where would I find it? All I saw in it were 2 of the pages. You mention setting up curriculum to have Jesus in December. Do you have a calendar still of the intended weeks? I thought I saw it somewhere on your site before, but can’t seem to find it now. I’m planning on buying the set, but I’d like to follow along with the weekly plan. Also on that subject, I get your email updates but it doesn’t include the lesson plans, is there a way to get that email? Thanks so much, this is so wonderful! PS. Last year I did one lesson… X marks the spot – my son still always talks about and gets excited any time he sees X! You can subscribe to just the kids newsletter (or the full newslette), and I will be reposting each week’s lessons the Thursday before each week. That will begin Sept. 1. Thank you so much for this curriculum. I am just finishing up doing it with my 6 and 3 year old girls, and they love it. I really chose it so I would be more intentional about teaching my 3 yo her letters and numbers- so I loved that that was combined with their Bible lesson for the day. They have absolutely loved going through this curriculum, and I have too! So many great ideas I never would have thought of! And they have such lovely letter notebooks from it. Do you have any suggestions for what to do now? I am thinking of doing a character/virtue based study, but haven’t been able to find one that I love yet.